One thing I really hate is jobsite dust, especially concrete dust. It gets all over the finished woodwork and always finds a way into my lungs. So the way to combat dust is to use a vacuum or a dust extractor. But we need one small enough to fit in the truck with the rest of the tools, and Bosch has one in the new 3931B-SPB 6.6-gallon Wet/Dry Vacuum. The 3931B-SPB is smaller than its predecessor but it pack a lot of power, offering a water lift capability of 100 inches and a 130 CFM rating. 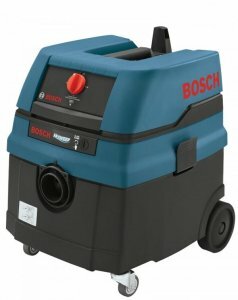 Sucking up dust efficiently and not clogging up your dust extractor at the same time is not an easy task but the 3931B-SPB is able to do this with Bosch's PulseClean technology. This feature uses pulsing movements to shake dust from the filter during operation. The vac also features a soft start motor that runs at only 69db and After Run to empty the hose ofter the vac is shut off. A 25-foot cord and a 10.5-foot locking hose ensures you have enough length to put the dust extractor where you need it. The Bosch 3931B-SPB is expected to retail for $499 and includes 2 polyester filters that capture three microns at 99.93 percent, and a plastic bag. Optional accessories include an antic-static hose, HEPA filters, paper bags, 6-piece vacuum wand and nozzle kit, and other hose adapters.